Together visits Radisson RED Brussels, Radisson’s trendy hotel in the European quarter. Just 12 kilometres from the airport, the Radisson Red Brussels is situated in the European quarter just a hop, skip, and a jump away from the European Parliament. Not far from many of the city’s main attractions, it’s an ideal place to base yourself if you’re in Brussels for work or a short city break. From the moment you walk through the hotel’s revolving red doors and take in the bold signature red and white style of the Radisson’s brand aimed at target families, you can’t help but be delighted by the fun and youthful vibe of the lobby itself and cheerful hotel staff. The decor is modern, hip, and fun, with friendly spaces and a relaxed and informal atmosphere. Organized with self check-in desks, pool and table tennis tables, and a bunch of flat screens showing photos of past guests in comical poses, you know immediately that you’re not in traditional hotel. 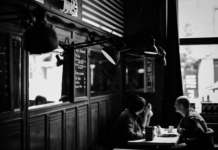 Employees, or Creatives, as they are called, were found through an innovative social media campaign. All staff are international and polyglot. Located in the heart of bustling Brussels, you can find one of the most ‘family friendly’ venues available. Indeed, the Radisson RED Brussels hotel stands in the building just adjacent to the European Parliament, almost allowing guests to watch the plenary sessions through their room’s window. It might be the least location you’d think about for an afternoon break with the kids, family yoga workshop or child’s birthday. And yet, the ‘RED’ – as we call it – meets the double challenge of appealing to both the EU quarter’s busy business crowd and local tribes. With its large bench seats and all-day dining options, the OUIBar + KTCHN proves to be a super comfy and convenient spot to refuel any time – a kids corner at breakfast time and a waffle bar, with a kids menu available for the rest of the day. It’s open every day of the week from breakfast to dinner so you can drop by anytime for breakfast, snacks or more sophisticated dishes. The fuss-free but wellbalanced menu offers enough options for everyone’s liking at a fair price. Plus, the kids will love the large illustrations decorating the walls. 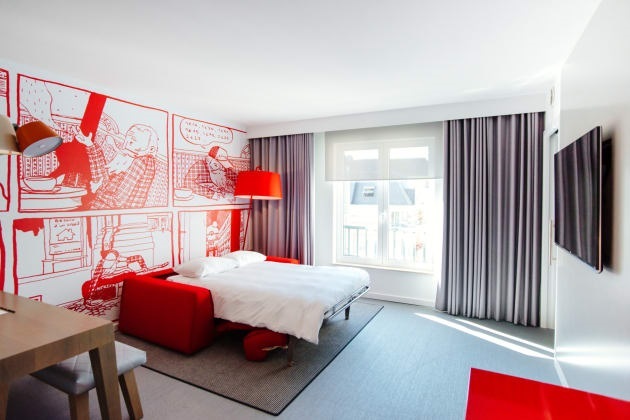 As a matter of fact, the hotel’s designers collaborated with Belgian cartoonists Wauter Mannaert and Max de Radigues – so it almost feels like visiting a Comic Strip museum. The Radisson RED Brussels also offers a full range of in-house activities, going from the PlayStation 4 for the lazy ones, up to a foosball table and snooker for those who are allergic to pixels. Organized in partnership with Pop Up Yoga Concepts – Kids and Family Yoga classes and workshops are regularly announced on the hotel’s Facebook page. Something to celebrate? During the weekends, the hotel’s Events & Games Studios are available to rent for kids birthdays with plenty of fun activities you can choose from to animate the party. And just five minutes away from the hotel is the Museum of Natural Sciences – perfect for a fun and cultural visit with your children. Last but not the least, the RED has created dedicated ‘Family Suites’ – a specific room category that can host up to five people in perfect comfort. These suites have 2 interconnecting rooms – one for adults, one for youngsters – where everybody can relax and live in harmony while taking advantage of familyfriendly amenities such as the TV’s wireless streaming tech’, Kids channels and welcome gifts. Each room is a single suite with two key areas: an adult room and a living room with sofa bed to accommodate the children. There is also a large bathroom with shower and bath, convenient for all ages! Visit the Radisson RED Brussels and not only you will wish to stay, but very probably your kids will not let you leave.